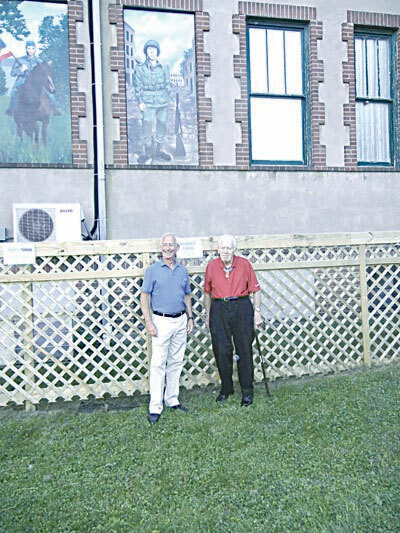 Neil Gilberg, left, and Francis Currey stand in front of the mural honoring the Medal of Honor recipient at the Sullivan County Museum in Hurleyville on July 27. HURLEYVILLE  August 6. 2013  An orphan at 12, raised by foster parents, Loch Sheldrake native Francis S. Currey has lately been “adopted” by the town he called home for much of his youth, Hurleyville. Ever since the day in 2004 when he was cast out of obscurity, the Medal of Honor recipient has been grateful for the parades, pomp, speeches and fireworks his hometown puts on once a year in his honor. “I am happy that they still remember me,” Currey said from his home in Selkirk, a suburb of Albany, several days after last Saturday’s 10th annual Francis Currey Day. Fragile but still active at 88 (he had just come in from cutting the grass, some of which he mows by push mower, and still rakes the leaves), Currey reflected on the day which was to define his life decades later. “The point is, I had nine months of combat, five before and four after,” Currey said of his heroics on Dec. 21, 1944. The then 19-year-old Army Sgt. was credited with actions that led to him receiving the nation’s highest miliary honor (see sidebar). For Currey, what he did seemed all in a soldier’s day’s work. “Then [the Army] made a fuss over it,” he said. On July 27, 1945, at Camp Oklahoma City redeployment center near Reims, France, Major General Leland Hobbs presented Currey his medal shortly before the soldier was shipped back home. While visiting Washington, DC, in January 1946, Currey met Gen. Omar Bradley, then heading the Veterans Administration with instructions from President Truman to straighten out the agency (“It needs it again today,” Currey said of the VA’s successor, the Department of Veterans Affairs). Gen. Bradley encouraged Currey to go back to New York and enter a school that trained veterans’ counselors. He had found his calling, and from 19501980 Currey worked at the giant Albany VA Medical Center. He received numerous promotions and eventually became a supervisor. In retirement, he took courses in horticulture and started a landscaping business. Later, he spent a couple of decades in South Carolina, where he had lots of friends. He took a job at a hotel in Myrtle Beach booking conventions, the last in 2002. Four years ago he moved back to Selkirk. Currey has had to curtail his traveling, especially overseas. He was planning to attend the Gettysburg National Monument on the 150th anniversary of the battle. Later this fall, he plans to travel to Dallas. Currey was invited to attend a Veterans Day ceremony in the county this November 11, but said it depends on how he feels. Currey joined the Army in June 1943, one week after graduating from Hurleyville High School. “We had 11 in the class,” he recalled. He remembered Hurleyville as a thriving place in the 1930s and ’40s, reeling off a list of establishments. In 2004, then Town of Fallsburg Councilman Neil Gilberg organized the first Day to honor the local hero, and has been involved ever since. Another key player has been US Navy Senior Chief Joseph Collura. Knee surgery (2011) and a cataract operation (2012) kept Currey away from the past two observances. Events took place on Friday as well this year, when his mural was unveiled at the Sullivan County Museum in Hurleyville. One notable absentee was Irving Kuskin of New Jersey, one of the men rescued from certain death by Currey’s actions. Kuskin has attended most of the annual celebrations. “He thought he might drive up, but his wife was ill,” Currey said of his former Company K comrade. “It was a good program. I was really surprised at the crowd at the fireworks Saturday night. I never saw such a crowd,” Currey said. Among the highlights of the ceremony was a flyover by Black Hawk helicopters. “They were 15 minutes late,” Currey chuckled knowingly. In the world of the soldier, SNAFUs are to expected. Overseas: July 1944, landing at Omaha Beach several weeks after D-Day. Later served in Company K, 120th Infantry Regiment, 30th Infantry Division. By the numbers: Out of 464 Medal of Honors awarded during WWII, about half were posthumous. By one reckoning, Currey is one of 10 recipients from WWII still living, and the only one from New York State. Other medals: The Belgian government bestowed upon him that nation’s highest honor, the Order of Leopold. He was also presented with the Silver Star, Bronze Medal and Purple Heart (he sustained a gunshot wound). Wife: Wilhema. The couple will celebrate their 65th anniversary next January. HURLEYVILLE  One familiar presence was missing from the 10th annual Francis Currey Day  Art Hussey Sr., of Mountaindale, who passed away on November 24, 2012 at 88. Art saw service on the battleship USS Iowa during WWII and was involved in the ship’s assigned task in the Atlantic Ocean off Newfoundland known as the Tirpitz Watch  preventing German battleships and supplies from raiding equipment and supply convoys providing badly needed supplies to Allied forces in England and Russia. Hussey was a corrections officer at Woodbourne Correctional until his retirement in 1983. He continued his community service as Commissioner in the Hurleyville Fire Co. and a member of the Fallsburg PD in the summer months. He was also director of a summer programs for Fallsburg youth, teaching them the lessons of civic responsibilities and work ethics. The program  in which the youth called themselves “Art’s Animals”  was responsible for many beautification projects through- out the town. Hussey’s public service continued in his work as a purchasing agent, volunteer and active “Grandpa” to children both in his family and around town. Art’s family  wife Arlene Hussey, children Kathleen Smith, Bill Hussey, Art Hussey, Jr., Wayne Anderman, and Robynne Anderman Malman  wish to thank Fallsburg Supervisor Steve Vegliante, the town board, Neil Gilberg, Joe Collura and the other dignitaries for recognizing his service on July 27.